At the 1964 Turin Motor Show, British racing car manufacturer Elva revealed the prototype for a mid-engined production car. The reason it was launched in Italy was that the car was styled and bodied by local carrozzeria Fissore. 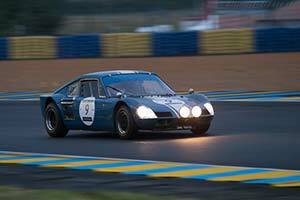 Dubbed the GT160, it was effectively a coupe version of the successful Mk VII sports racer. Accordingly, the GT160 was built around a spaceframe chassis with independent suspension on all four corners. Like most of the Mk VIIs, the production car featured a BMW-sourced two-litre, four-cylinder engine. Further developed by Nerus engineering with the help of BMW, it produced around 185 bhp. Mated to a Hewland five-speed gearbox, it was mounted longitudinally ahed of the rear axle. Although styled by Fissore's Trevor Fiore, the very compact GT160 was still easily recognisable as an Elva due to the twin air-intakes on the nose. Unique to the design were the extendable radiator intakes mounted ahead of the rear wheels, which allowed for additional cooling when needed. The car tipped the scales at less than 600 kg and thanks to its slippery shape could reach a top speed of 160 mph (hence the name). Intended for series production, the GT160, unfortunately did not make it beyond three prototypes, the second of which was not even completed in period. The reason to abandon the project was the high build-cost, which was about twice of what would make the production car reasonably priced. The first car was raced in period, making appearances at the Nürburgring and at Le Mans in the hands of Richard Wrottesley and Tony Lanfranchi. All three GT160s have survived and are accounted for. The second was car eventually completed with a Buick V8 engine, while the other two still retain the BMW engine they were originally delivered with.